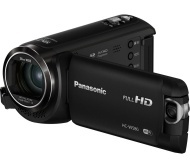 alaTest har samlet og analysert 19 anmeldelser av PANASONIC HC-W580EB-K Camcorder - Black. Gjennomsnittlig rangering for dette produktet er 4.2/5, sammenlignet mot en gjennomsnittlig rangering på 4.1/5 for andre Videokameraer. Vi analyserte bruker- og ekspert rangeringer, produktalder og flere faktorer. Sammenligned med andre Videokameraer blir PANASONIC HC-W580EB-K Camcorder - Black tildelt en total alaScore™ på 89/100 = Meget bra kvalitet. Easy to use . Nice clear picture on screen but a bit difficult to see in sunshine. Nice and compact. Attractive appearance. Does what it says in the description. I felt the product use instructions should have included more detail, particular for anyone like me who has never before used a camcorder. The main downside is that you cannot see the screen in sunny weather. I would have preferred a view finder but they are more expensive. I am not sure about the second camera lens and not sure if I will use it but it is there if the need arises. Quality of picture, Powerful zoom range, Battery Life was good. On/Off and other nearby buttons too small and fiddly. Difficult to know whether they have been pressed correctly. Good Software. Easy to do short video clips. PIP [Picture In Picture] is a good idea. Stabilization 5 axis is visible, and helpful when a movie is record w/o external stabilizer or a tripod. PIP camera is inconvenient to adjust during Recording, and shake a screen. When need, better to use external stabilizer.